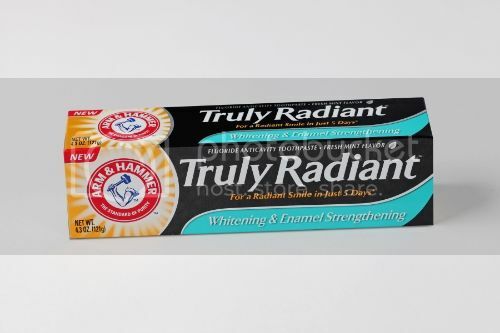 The Arm & Hammer Truly Radiant collection not only whitens your teeth for the brightest smile possible but it also cleans and strengthens your teeth. It's the only toothpaste out there with baking soda, peroxide and active calcium that smooths surface imperfections while restoring shine. Which is great for me since I also have sensitive teeth! For the ultimate cleaning you can use the Arm & Hammer Truly Radiant Spinbrush which removes 100% more plaque than manual toothbrushes and the Truly Radiant Whitening Booster, which is clinically proven to whiten teeth in just one week and contains 3x more whitening agnet than the leading whitening strip. If you don't believe me check it out yourself! Be sure to check out actress, author and TV host Alison Sweeney's tips to bring out your inner radiance and share how you live radiantly every day! I definitely need to find a good whitening toothpaste! I'm always on the hunt to make my teeth whiter and sometimes the strips hurt my teeth!! I'l have to check them out!! I always need some new toothpaste recommendations!! and I always love one that whitens! Oh I always love a whitening toothpaste but haven't seen this one in stores yet...thanks for sharing! I also am always looking for a good toothpaste! Thanks for sharing this, I'll keep an eye out for it!